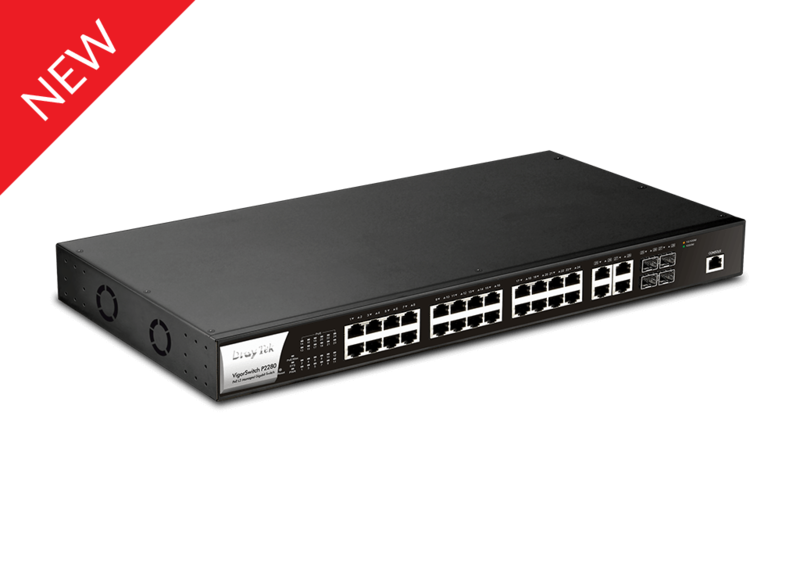 The VigorSwitch P2280 is a 24 port Power over Ethernet (PoE) Gigabit Ethernet switch with an additional 4 Gigabit RJ-45/SFP combo ports. Each PoE port can provide up to 30 Watts of power which is sufficient to power devices such as wireless access points, IP phones and IP surveillance equipment. With 56 Gbps switching capacity and 41.7 Mbps forwarding rate (64 bytes) this high performance switch ensures rapid data delivery in modern day networks. The 24 ports of the VigorSwitch P2280 are 802.3at and 802.3af compliant providing up to 30W per port along with a total power budget of 340 Watts. This is enough to provide power using Ethernet cabling for a number of network devices such as wireless access points, IP phones, and IP cameras. PoE allows installation of these devices where no nearby mains power is available. This results in a reduction in the need for power cables and adapters, lowering the cost of installation. The VigorSwitch P2280 complies with IEEE 802.2az Energy-Efficient Ethernet to provide a power saving feature. The switch will automatically detect idle clients and cable length to adjust the amount of power required. This green networking feature reduces power consumption. The VigorSwitch P2280 supports both port-based and tagged-based VLANS which can be used to add security to your network and create workgroups within an organisation. This allows the network administrator to control LAN access and also reduce unnecessary network traffic. 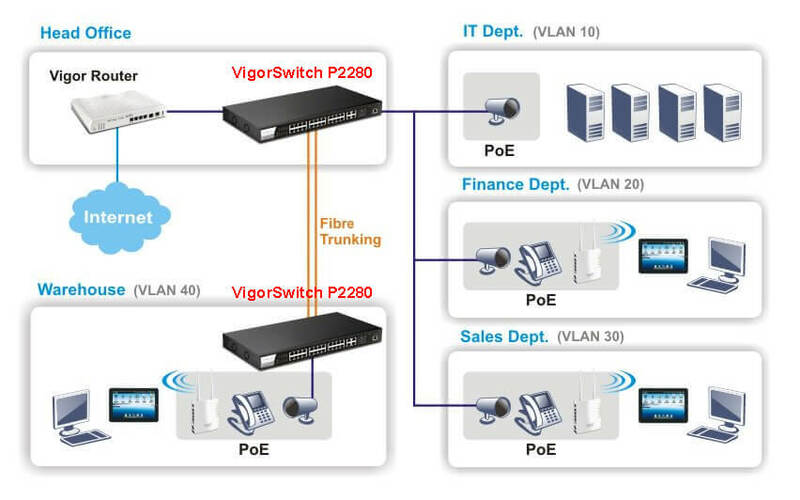 Up to 256 VLANS are supported in the VigorSwitch P2280. In addition to 802.1q Tag-based VLANS, Auto Voice and Auto Surveillance VLANS are also supported so that traffic from an IP phone or an IP camera can be identified automatically without the need to specify each of their MAC address. The respective QoS (Quality of Service) policy can be applied easily to ensure the best call and video quality. The VigorSwitch P2280 has a number of security features to prevent the local network being overloaded by superfluous traffic. This includes Storm Control to limit the amount of broadcast and multicast traffic on each port, and DoS Defense to protect the network being flooded by malicious traffic. In addition, the VigorSwitch P2280 also includes IP Source Guard, ARP inspection, and DHCP Snooping. Security can be enhanced by using 802.1x port access control to block un-authorized users from connecting to the network. Access control is also available through IPv4, IPv6 and MAC addresses filtering. Heavy LAN traffic can affect critical or time sensitive applications such as VoIP or video streaming. The QoS feature of the VigorSwitch P2280 can prioritise critical or time-sensitive data so that it will not be affected by other traffic. The VigorSwitch P2280 supports up to 8 traffic queues with customized weightto prioritise data using 802.1p CoS, DSCP, and IP Precedence parameters. The Auto Voice VLAN and Auto Surveillance VLAN feature in the VigorSwitch P2280 is ideal for networks deploying IP cameras and IP phones. The VigorSwitch P2280 supports link aggregation using both static configuration and LACP (Link Aggregation Control Protocol). With Link Aggregation up to 8 LAN ports can be grouped to provide high throughput to cascaded switches. Up to 8 Link Aggregation Groups can be configured with each group having up to 8 port members. The VigorSwitch P2280 features a brand-new interface design making configuration and management much easier. The responsive web design allows the switch to be monitored through devices having various screen sizes. (Check the GUI of VigorSwitch P2280 from Live Demo). The VigorSwitch P2280 can also be managed through the Command-Line Interface (CLI) via Telnet or SSH, as well as SNMP, RMON, and Syslog. 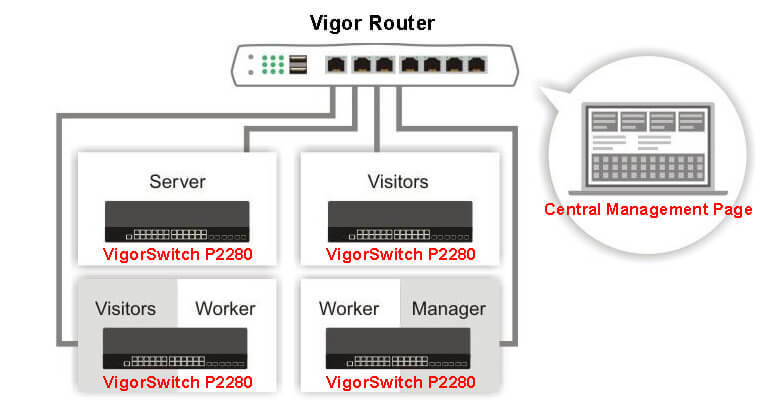 VigorSwitch P2280 is compliant with Central Management feature of Vigor router. It can be managed through the Vigor Router’s management page. 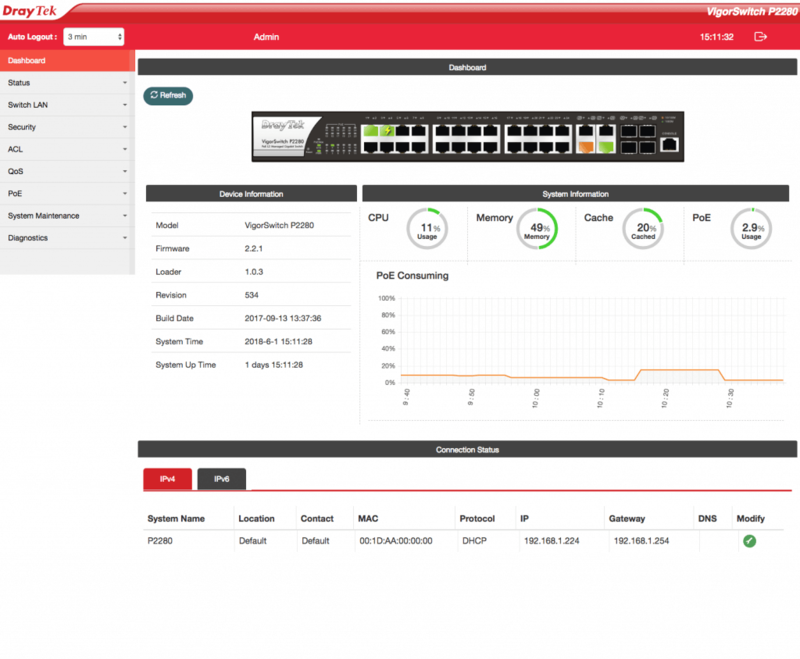 Functions that can be performed using Central Switch Management include provisioning, configuration, monitoring and maintenance of the VigorSwitch. The VigorSwitch P2280 can be run in standalone mode and can also be managed using the Central Switch Management feature of Vigor routers. This provides a central console to manage the VigorSwitches connected directly to the router. Functions that can be performed using Central Switch Management include provisioning, configuration, monitoring and maintenance of the VigorSwitch. Please click this link http://eu.draytek.com:12280/ for VigorSwitch P2280 web interface.